Upgrading your old machine tool NC or PLC control system to a state-of-the-art system is a cost effective way to increase reliability and productivity in your production process. 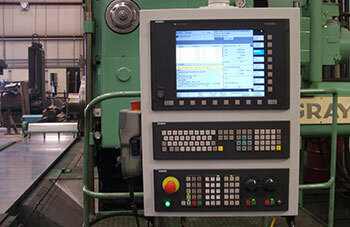 MPE can provide the engineering know-how to integrate a new CNC or PLC system to your existing machine tool allowing you to take advantage of the many innovations that have occurred in CNC technology over recent years. A machine rewire, complete with full documentation, will further enhance the reliability of the machine and enhance machine serviceability for years to come. MPE Electrical Retrofit Services include CNC Control and PLC programming services, On-Site Troubleshooting of all electrical systems, Servo and Spindle Motor Service, Motor Drive Service and Replacement, Scale Service and Replacement, Down-Wire and Re-Wire for Machine Moves and Replacement parts for all major brands including Siemens, Fanuc, NUM, Heidenhain, Allen Bradley, and many more.